If you head to a British Superbike race, you’ll find a whole stack of super-competitive support classes, feeding the best riders into the premier classes. 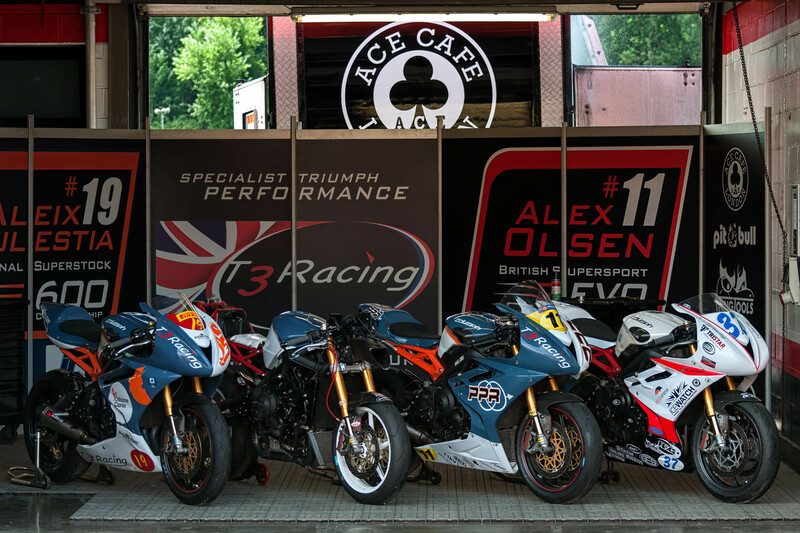 For 600cc bikes, there are three clear stepping-stones leading you into the prestigious British Supersport class – the Triumph Triple Challenge (TTC), National Superstock 600 and British Supersport evo. From trackside, or with a quick glance at the rules, it’s hard to see a great deal of difference between the four classes, but from the handlebars the bikes are a step apart. T3 Racing have bikes competing in all four categories and were kind enough to invite us down to Brands Hatch for a day razzing round in circles trying them all out. Now that would be one hell of a personal fleet. Here’s a round up of the four different classes these bikes come from, along with the main performance modifications permitted. Summary – A one-make series for the Triumph Daytona 675 and 675R models. Summary – Production based 600cc sports bike racing with limited modifications. Summary – Modified, but production based 600cc sports bike racing. While the other three race bikes were having fun and games with noise testing, I kicked off the day’s test with a couple of sessions on board the TTC-spec Daytona 675R of Jesse James Jones. The essence of the TTC class is to provide close, affordable racing, so the modifications to the bikes are both limited and tightly controlled. The noise-testing split provided all the clarity you could ask for – the full race bikes were back and forth with baffles, while the TTC bike sailed through. Spec wise it’s at the level of a nicely prepared, reliable track bike – race bodywork, well set-up suspension and no engine tuning. As I lid up and head out I’m thinking it’s going to feel pretty damn similar to the standard 675R I’ve been ripping round on. Immediately there are clear differences – the TTC bike may look and sound pretty stock, but the changes to handlebar and footrest positions are prominent. Especially when you’ve been riding the standard bike recently. The benefit of the higher pegs manifests itself at the first apex I hit with any commitment. Where I would normally be shuffling my foot up the footrest to avoid grinding through to my toes on the asphalt, my five little piggies are untroubled. The extra ground clearance is needed too. With the suspension set up dialed in, there’s so much more potential to push than on the standard bike. Coming in to Paddock Hill bend, I’m a little too late on the brakes, the rear tyre is skipping around on the bumps and the edge of track has become the target of my fixation. I’m forced to turn in, still with a load of brake on. But the stiffer set up means I’ve still got fork travel left to deal with turning, where the road bike would have bottomed out and gone down. With more support from the springs, you’ve got a more stable platform to push from, allowing you to attack bends harder and faster. On the way out of a turn, the TTC bike feels just like the road bike – that smooth drive we’ve come to love the 675 for. The race bike’s setup does hold a tighter line through the turn, so it always feels like there’s more room on the exit than with the road bike. Pushing harder, the limits of the standard motor begin to show. Drop down to second for Clearways, the bike bucks in protest on the way in and I have to shift up while still cranked way over on the exit. Next lap round I hold it in third, the entry is way more settled, but I have to get on the gas so hard, so early to get off the turn. The 675 has a wider spread of power than any other 600cc class bike, but take anything to a track and ride hard enough and you’ll come up against a limit eventually.